Boy. What a softshell I’m turning out to be. I wanna be where the people are, I wanna see, wanna see ’em dancing, walking around on those…What do you call ’em? Oh… feet! Ariel, what are you doing here with this riff-raff? Wait a second. Ladies, ladies! It don’t matter who’s comb it is; what’s important is leaving! 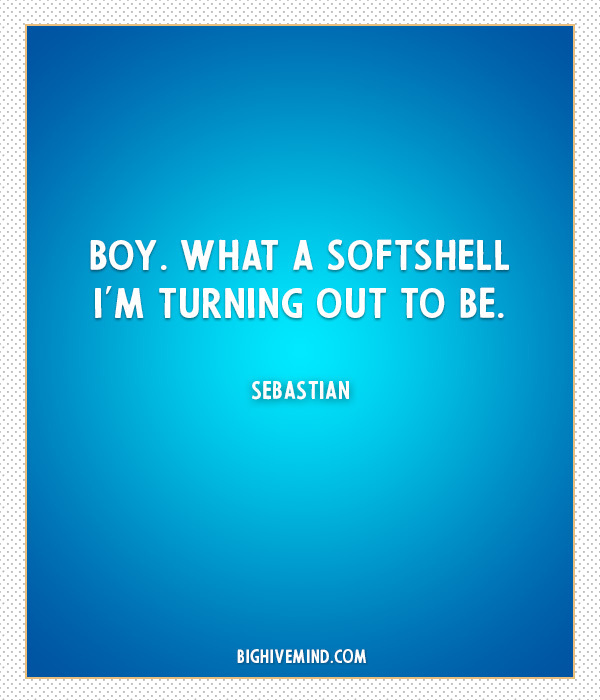 Alright, Sebastian. You must remain calm. Dis is NOT your fault. All you have to do is go in there and calmly explain that Melody has run away. No reason to lose your head. Whatever you do, you abso-tively, posi-tutely, must. Not. Panic. Ariel, please! Will you get your head out of the clouds and back in the water where it belongs? What’s that word again? Street! Up where they walk, up where they run, up where they stay all day in the sun, wandering free, wish I could be part of that world! And don’t you shake your head at me, young lady! Maybe there’s still time. If we could get that witch to give you back your voice, you could go home with all the normal fish and just be. 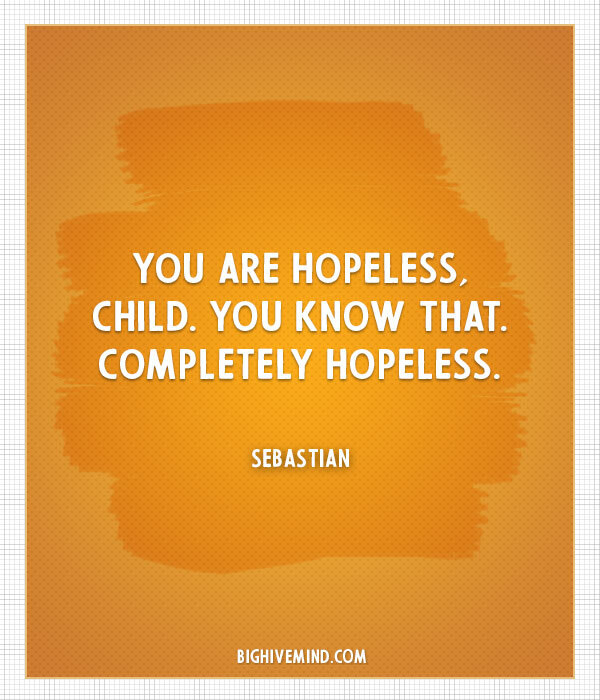 You are hopeless, child. You know that. Completely hopeless. We got no troubles…life is bubbles under the sea. Each little clam here know how to jam here under the sea. How do I get myself into these situations? 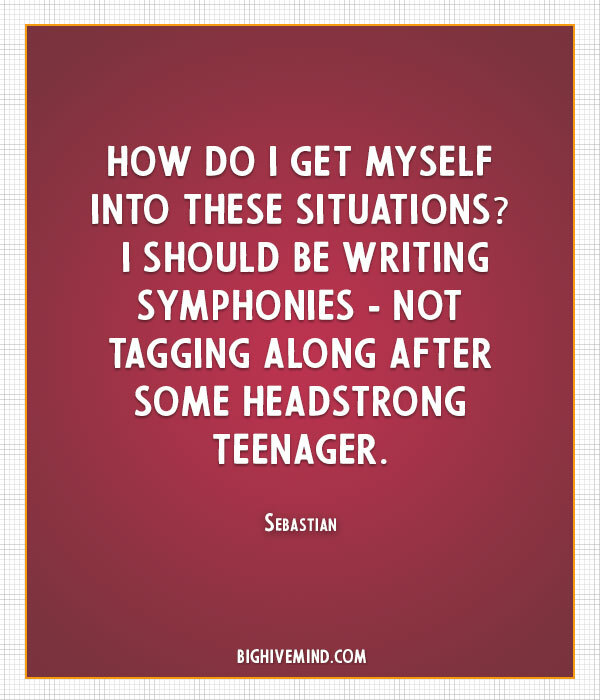 I should be writing symphonies – not tagging along after some headstrong teenager. It is expressly forbidden for you to be swimming beyond the safety of the sea wall. Jeez, mon, I’m surrounded by amateurs. You want something done, you’ve got to do it yourself. Oh my gosh! Oh my gosh! Have you ever seen anything so wonderful in your entire life? I tried to stop her, sir! She wouldn’t listen! I told her to stay away from humans! They are bad! They are trouble! They are. Sweetie, it doesn’t matter if you have fins or feet. We love you for who you are on the inside, our very brave little girl. If only I could make him understand. I just don’t see things the way he does. I just don’t see how a world that makes such wonderful things could be bad. What would I give to live where you are? What would I pay to stay here beside you? Ariel – what, are you mad? How could you – what is all this? Just be. Just be miserable for the rest of your life. Ariel, you’re under a lot of pressure down here. Come with me, I’ll take you home and get you something warm to drink. Oh, we’ve got to keep Melody away from her. Until Morgana is found, Melody can’t go into sea. And neither will I. The sea witch? Why, that’s I couldn’t possibly no! Get out of here! Leave me alone! Your Majesty. This will be the finest concert I have ever conducted. Your daughters, they will be spectacular! That’s it. I’m booking meself on a cruise. Teenagers. Dey think dey know everything. You give dem an inch, dey swim all over you. 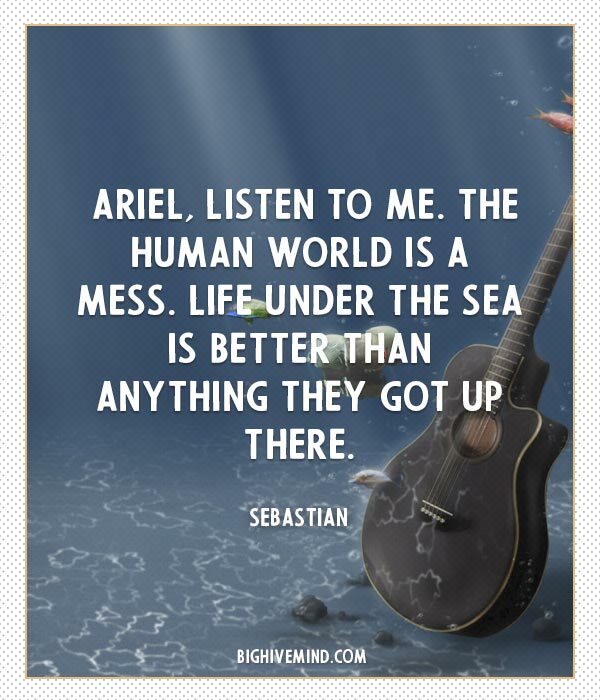 Ariel, grab on to that. Flounder, get her to that boat as fast as your fins can carry you! I’m 16 years old! I’m not a child anymore! He loves me. He loves me not. He loves me! I knew it. Ha! You know perfectly well what’s kicking! Definitely not! Why, if Ariel was my daughter, I’d show her who was boss! None o’ dis flitting to the surface and other such nonsense. No, sir! I’d keep her under tight control. This has got to be, without a doubt, the single most humiliating day of my life! Somebody’s got to nail that girl’s fins to the floor. A crab my age should be retired! Getting a tan and playing sea gold sipping a tuna colada. I mustn’t overreact. I must remain calm. All right, I’m going inside. You can just stay here and watch for sharks. Why don’t you go tell my father? You’re good at that! What do they got a lot of sand? We got a hot crustacean band! Oh, sweetie, nothing’s wrong with you. If I become human, I’ll never be with my father or sisters again. You’re not getting cold fins now, are you? “Sebastian, you watch over her,” he said. I’m too old for this! A crab my age should be retired! Getting a tan! Playing sea golf! Sipping a Tuna Colada! Not babysitting another teenager. I’ve never seen a human this close before. Oh he’s very handsome, isn’t he? I should’ve of known I couldn’t keep Melody from the sea. It’s a part of her, and a part of me. I have to go. 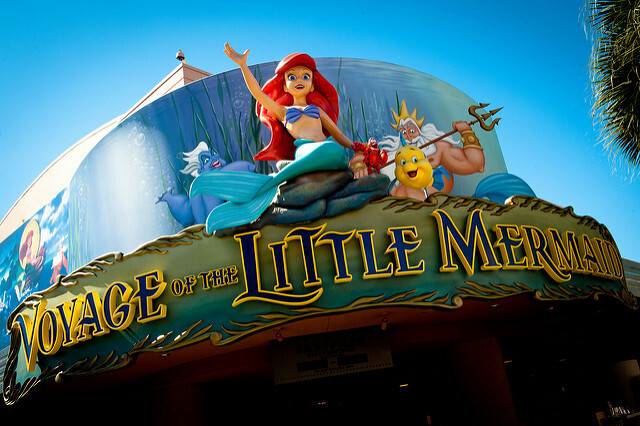 Ariel, what – what are you- jumpin’ jellyfish! Oh, the concert! Oh my gosh my father’s gonna kill me! Well, it’s like I always say, your majesty, children got to be free to lead their own life. There is a world where hope and dreams can last for all time. I’m sorry, Flounder. But if Morgana is anything like Ursula, she’ll never give up. This is the only way; Melody can’t know about Merpeople or Atlantica, or even you, Daddy. You deliberately disobeyed me! I never want you going out there again. Do you hear me? It’s dangerous in the sea! I gotta see him again – tonight! Scuttle knows where he lives. Well, it was ruined! That’s all, completely destroyed! This concert was to be the pinnacle of my distinguished career. Now thanks to you, I am the laughingstock of the entire kingdom! Yes, yes. She has the most beautiful voice. Hmm? [to himself] If only she’d show up for rehearsals once in a while. Flounder, will you relax. Nothing is going to happen.